Create perfect silhouette with two easy techniques. The methods we have described, it is easy to create a picture of silhouette of any moving or static subject. Usually, to set the exposure of a photo, our goal is to correctly expose the main subject. We want, for example, that the person we are portraying is visible and not too dark or too light. Thus, an extremely bright background puts us in serious trouble. For example, if you want a romantic portrait of your girlfriend or your boyfriend with the sunset behind and you do not have available a flash, you can not help but have a tremendously overexposed sky. Since photography is an art, there is a creative way to take the advantage of these difficult situations to your advantage and create really strong images. The purpose is to create the silhouette is to create dark photo against a light properly exposed background. Point 2 differs depending on the shooting mode you have chosen : if you shoot in manual mode, you must set the individual parameters of exposure (as we have explained here ), if you shoot in aperture priority or automatically, you must use the exposure lock. The third point is only valid if you use the manual release mode. Otherwise, the exposure is calculated automatically by the machine. If your camera has a manual or semi-automatic mode, we will strongly suggest you learn to use it as soon as possible, it will derive immeasurable benefits. However, if you prefer or you are forced to use automatic shooting modes, pay particular attention to the flash. If you use it, the exposure will be certainly wrong and probably it will be extremely dark background, while the foreground subject will be illuminated more or less depending on the distance from the camera. Instead choose the auto without flash or, if you can disable it from the menu. Although the exposure is calculated in relation to the background, generally we want that the subjects are exposed fine. Generally, when you press the shutter button halfway, the camera sets both the measurement of exposure and the focus (unless you are using the manual release mode). So, how you can adjust the exposure for the background to focus on the subject? Use exposure lock or the manual release mode when the exposure is calculated and the time when the focus is calculated are separated, so that the problem does not exist. If you want to have more security in focus, then choose a higher value for the opening, as to increase the depth of field. As always, a good picture is born from the combination of technology and art. Now, you know how to expose, but you have to choose a subject or subject and compose your shot so that becomes effective. Your goal is to bring out the figures completely or almost completely black against a bright background. Therefore, first of all, the contours of the figures should be well defined. Train neglect all details in a scene that looks focused. For example, when portray a face, otherwise the features will not be recognizable. Similarly, if you want to highlight the curves of a body, airy clothes will not go well, as well as the hands beside the body. Since the subjects in this kind of photo, completely lose the volume, the interactions between them will be re-evaluated. Precisely because the subjects become two-dimensional, you can create interactions surreal to be exploited creatively artistic photos. With a background bright enough and using the methods we have described, it is easy to create a picture of silhouette. The light sources may be the most diverse, it is not mandatory to use only the usual sunset. This Article Has Been Shared 1670 Times! 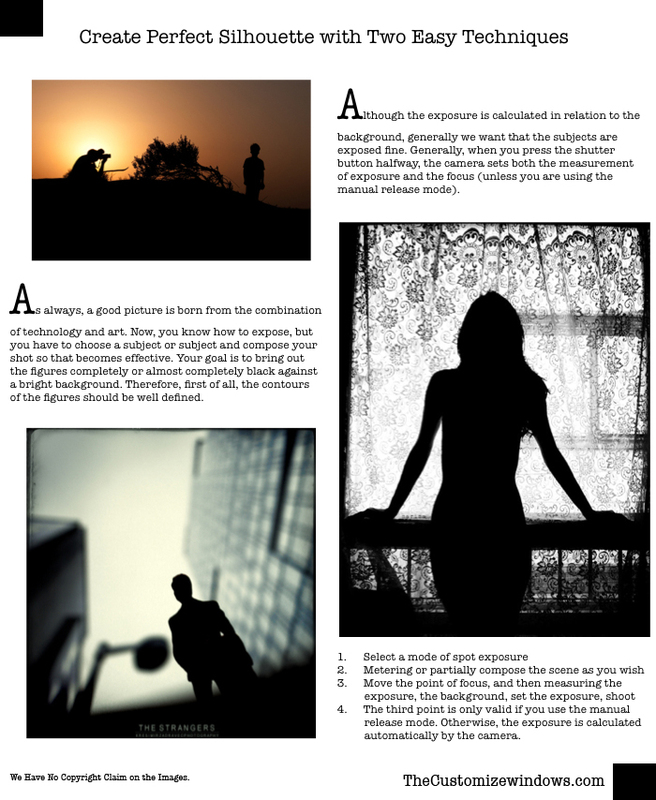 Cite this article as: Abhishek Ghosh, "Create Perfect Silhouette with Two Easy Techniques," in The Customize Windows, July 31, 2013, April 21, 2019, https://thecustomizewindows.com/2013/07/create-perfect-silhouette-with-two-easy-techniques/.